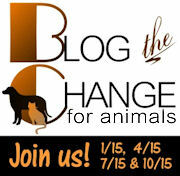 Today is one of the four days dedicated to Blog the Change for Animals, which is an incentive for people all over the world to talk about animal causes, hoping that more people can find out about them and lend a hand. As some of you might know, I live in Romania, a small state where stray cats and dogs have found homes near dumpsters, in parking lots, wherever they were accepted. Their biggest plight is that the government has been thinking of voting for euthanising all of them. You might have heard about the 100 sleigh dogs killed in Canada. That would be nothing compared to what could happen in Romania. I have written about this before, in the post Our strays in danger. People all over the country have organised protests and a petition has been started to prevent this massacre. I know that people from other countries might not be able to help in any way, but I can't help talking about this. I hope that, maybe, the stray dogs (some of which have become our friends, see Bobita, our doggie neighbour) will be allowed to live. If you are interested in this and understand Romanian, you can learn more about this at the site Adoptii Caini. They are trying hard to convince people to sign the petition against this horrible governmental decision, fighting for the fate of our stray dogs. If you are Romanian, please take a moment and sign the petition. Every helping hand matters. I would like to talk about another animal cause. Linda has lost her puppy Romeo in a car accident and has decided to offer the gift of a better life to other rescue dogs and cats in need. She has started a fund in Romeo's name, to help rescue dogs and also improve the conditions of shelters in South Africa, in particular the one where Romeo spent the first part of his life, Bellville Animal Anti-Cruelty League. You can read about this and about how you can help too at Animal Outreach and also the pdf Romeo's Wish, where you can also read his story. I wanted to write about this because Desiree, Linda's mother, and after that Linda herself have become good friends of mine. Romeo reminds me of my own dog Aschiuta, with his exuberance, friendliness and intelligence. Linda has also adopted another rescue puppy from the shelter and has given her a warm loving home. They have organised a raffle to raise money for the cause and you can read about it on this page. I invite you to buy a ticket and help those dogs live a better life. Rest in peace, Romeo! I hope your wish will come true. I have read your other posts regarding the stray dogs in Romaania. I do hope people there can pull together to help save these dogs lives. I will keep my paws crossed for them as long as you keep blogging about them so that everyone knows of their plight! Oh my gosh, this is terrible! Thank you for sharing the plight of Romanian strays. It is often said that sunlight is the best disinfectant, as though shedding light on a topic makes all the difference. While it does, action is the next step. I hope a humane solution is found soon for the sake of you all. Thank you for the kind words! I hope our dogs will have a better future. What a wonderful way to honor Romeo's memory! His spirit lives on in those helped by the fund. The mass killings proposal is something that sadly is common in many parts of the world. I truly hope that the public opposition in your area makes the difference for the animals who are strays through no fault of their own. Keep fighting, Lavi. Change frequently comes only when we refuse to accept anything else. Yep, hang in there, Lavi! Your work to make the lives of the dogs in your country will surely make a difference - bless you for all you do for them! By talking about it, you are spreading awareness. This is such a sad and difficult situation and I will pray that a happy solution is reached. Whilst I haven't met you, you truly are a great friend. This post shows how big your heart is and I am so, so proud of you. The plight of strays is the same the world over - all they want is to be loved and to find homes. Yet, people continue to breed and buy from pet stores. Further, those organisations that go into the rural areas and steralize animals, FREE OF CHARGE, receive little support and funding. This is something that I am so passionate about to bring this to the forefront of people's minds. It doesn't matter if it's a 1st world or a 3rd world country - animals are neglected the world over. EVERYONE can make a difference by saying no. EVERYONE can help - imagine if every household donated one bag of pet food per month to their local shelter... imagine!!!! Let's all make the change we wish to see in this world. It's our responsibility, after all! I am so proud of you and Linda, Lavi...two very special young women, who are determined to make a difference! The situation in Romania breaks my heart. Thank you for drawing attention to this! Thank you everyone for all the concern and encouragement! I hope that the next news I have about this subject will be good news. Spaghetti? Yes, please, with meatballs!